Here you are a preview of the workshops in program at LPM 2017 Amsterdam. The meeting begins on May 18,2017 in the spaces of RADION. Learning activities will take place in the dedicated classrooms every day starting from 15.00. Read carefully the requirements to attend the classes, choose your activity and register! 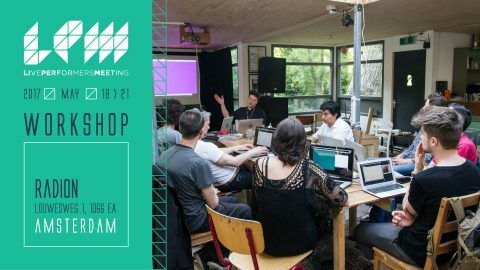 The Resolume VJ & Video Mapping workshop is intended to introduce to the participants the use of Resolume Arena Media Server, the most used tool for managing audio visual content at performances, stages, interactive installations. Starting with a basic interface explanation, you will progressively get to learn all the features of the software and get professional suggestions to use Resolume Arena at its best. During the workshop you will be asked to practice and try by yourself what you are learning. The next step of the class will be the presentation and application of the video mapping techniques using Resolume Arena. At the end of the workshop, the participants will be encouraged to experiment a video mapping on an “object” of their choice and to present it in front of the class. The intensive workshop provides knowledge and abilities to create interactive interfaces using Vvvv software and different devices: Kinect, Neurosky and Smartphone. During the workshop the attendees will produce graphic layouts on which will be possible to interact through hand’s movement, facial expressions, control of the thought and display touch. The workshop’s aim is to learn to manage the display of an innovative presentation, that can be employed in professional and working environment. It requires no specific knowledge: the course starts teaching the basics of Vvvv software (vvvv.org) and interactive environment with reference to contemporary art. The participants must have their own laptop (installation instructions vvvv.org/downloads | 32bit version + addons). Install also: VLC (videolan.org/vlc). Optional: a three-button mouse. During the workshops participants will have the ability to create together with the lecturers audiovisual project based on generative animations. In this term generative means that simple scripts in After Effects create the animation by calculation. The workshop is dedicated to experimenting creative minds in animations with a basic knowledge of Adobe After Effects. A beginners introduction to live coding environments for music production: TidalCycles (tidalcycles.org) and SuperCollider (supercollider.github.io). 1. Brief history of generative music and its aesthetical relations with live coding and others performing practices releated to software programming. Meanwhile, will be place an assisted installation of required open-source environments (TidalCycle for Atom and Supercollider IDE). 3. Introduction to Algorithmic Composition basic concepts using Live Coding configurations based on SuperCollider: SC+JITLibrary and SC+TidalCycle. PLEASE NOTE:Suitable for anyone with a laptop, is not required any programming skill of any kind. We remind you that the call to participate to LPM 2017 Amsterdam is still open! Registration form is only available on-line and the subscriptions will be accepted until April 10, 2017!